Simon Says Let it Snow! This week the challenge is Let it Snow! As bonus, all Art Impressions products are on sale at 25% off at Simon Says Stamp. Code is below! 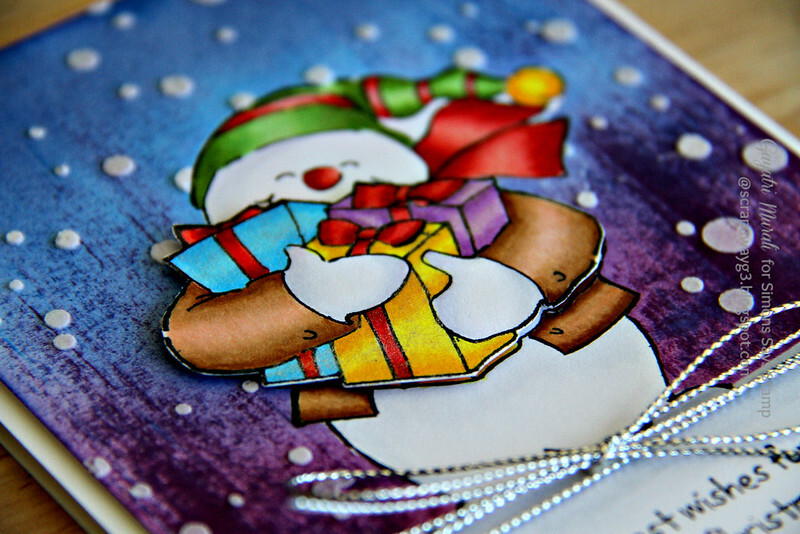 My focal point snowman is from Art Impressions called Snowman Shaker. I stamped the image on a white card stock panel and copic coloured the image. I also stamped the centre arms holding the presents image on a scrap piece of white cardstock, copic coloured and hand cut the image out. I will be adhered this image over the original full image using foam adhesives later. But first, I atamped the full image on masking paper, cut out and masked the coloured image on the card panel. I also masked the bottom part of the cardstock. Then, I took the mini Seedless Preserve distress ink pad directly on the paper and rubbed it to get the ink pad strokes. I did this to get the rays of light radiating upwards effect. I also did the same with Salty Ocean from the top of the card. To get a bit of blended effect I sponged both the ink with the blending tool. Once dry, I used white embossing paste to apply to stencil to get the falling snowflakes effect. Once dry, I removed the masking papers. I then used grey copic markers to ground the snowman. Here is when I adhered the arms holding presents on the main image using foam adhesives. You can see the dimension on the photo below. I then stamped the sentiment also from same stamp set using black ink, tied silver twine from May Arts around the panel before adhering the panel on the card base.Here is another closeup. Love these bright happy colors, Gayatri! AND that background shading! WOW!!! Totally adore the colors of your choice, bright and cheerful! 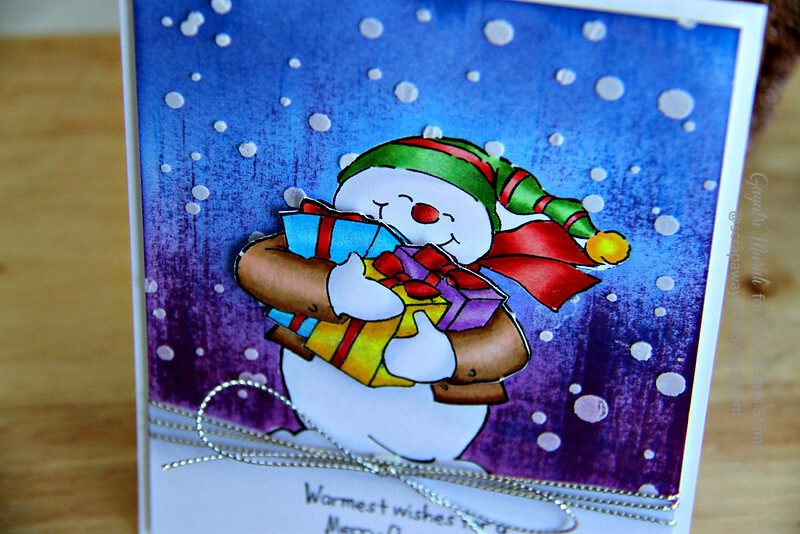 A gorgeous card Gayatri, a stunning background and adorable, cute fabulously coloured snowman.!! so pretty, luv the bold coloring! hope you have a fabulous weekend! Just adorable Gayatri. Lovely card. Love the bright colors and the background. 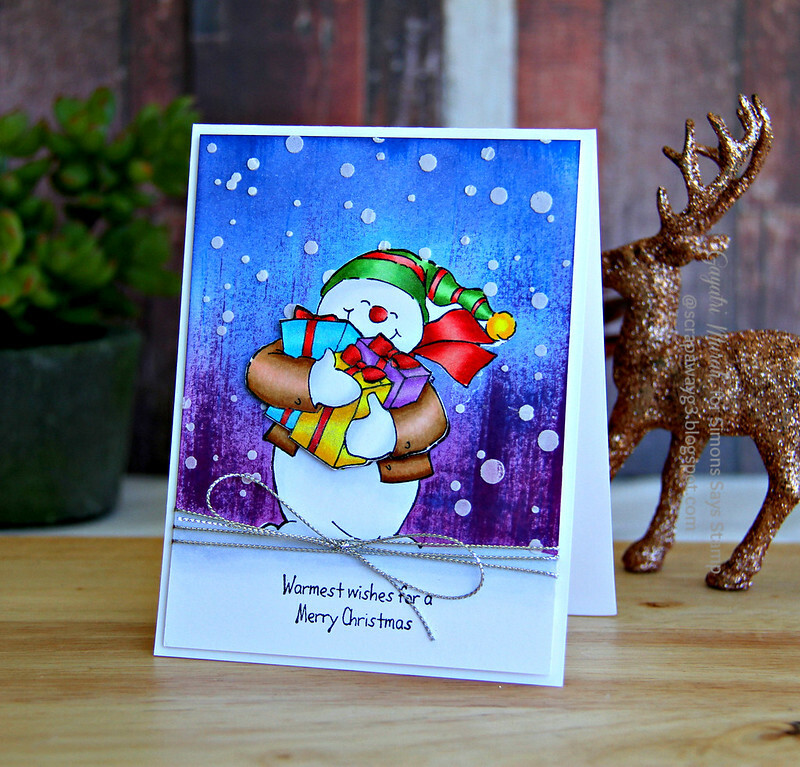 This card makes me smile with its happy snowman.